The sound was stabbing, slicing, shivering, like metal scraping against stone. Eragon's teeth vibrated in sympathy, and he covered his ears with his hands, grimacing as he twisted around, trying to locate the source of the noise. Saphira tossed her head, and even through the din, he heard her whine in distress. Eragon swept his gaze over the courtyard twice before he noticed a faint puff of dust rising up the wall of the keep from a foot-wide crack that had appeared beneath the blackened, partially destroyed window where Blödhgarm had killed the magician. As the squeal increased in intensity, Eragon risked lifting a hand off one ear to point at the crack. "Look!" he shouted to Arya, who nodded in acknowledgment. He replaced his hand over his ear. Without warning or preamble, the sound stopped. Eragon waited for a moment, then slowly lowered his hands, for once wishing that his hearing was not quite so sensitive. Just as he did, the crack jerked open wider--spreading until it was several feet across--and raced down the wall of the keep. Like a bolt of lightning, the crack struck and shattered the keystone above the door to the building, showering the floor below with pebble-sized rocks. The whole castle groaned, and from the damaged window to the broken keystone, the front of the keep began to lean outward. "Run!" Eragon shouted at the Varden, though the men were already scattering to either side of the courtyard, desperate to get out from under the precarious wall. Eragon took a single step forward, every muscle in his body tense as he searched for a glimpse of Roran somewhere in the throng of warriors. At last Eragon spotted him, trapped behind the last group of men by the doorway, bellowing madly at them, his words lost in the commotion. Then the wall shifted and dropped several inches, leaning even farther away from the rest of the building, pelting Roran with rocks, knocking him off balance and forcing him to stumble backward under the overhang of the doorway. As Roran straightened from a crouch, his eyes met Eragon's, and in his gaze, Eragon saw a flash of fear and helplessness, quickly followed by resignation, as if Roran knew that, no matter how fast he ran, he could not possibly reach safety in time. A wry smile touched Roran's lips. 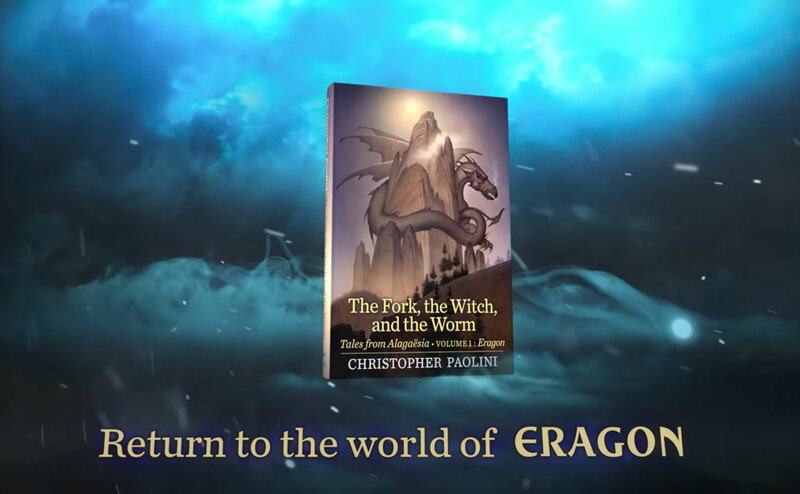 Text © 2011 by Christopher Paolini.